I’ve just realized that I’ve been blogging non-stop the past few days. And I have yet to post those way overdue entries from November and December. But now, I’ll like to talk about this blogger that I’ve been a fan of the past few months. This post is long and contains a few big, bombastic words (I’m analyzing a blog and a blog entry). So gore-fest loving people, no gross pictures for now. He is a scientist. He holds a PhD. from the University of Stanford and migrated to Singapore (he was originally from China) to work in a top scientific institution. But due to certain circumstances, he was retrenched (or fired, however you want to look at it) from his position and despite sending out resumes to universities and numerous institutions in Singapore, he was unable to find a job. I’m not sure why he does not want to get a job overseas like the U.S or the U.K or Europe or China. I think part of the reason why he stay put in Singapore is because he became a citizen. He did explained it somewhere in his blog but I can’t find the post citing his reasons (i.e. not enough time, I’m going to be late for a dinner with friends). I can’t remember how I stumbled across his blog (I think it was through The Temasek Review) but it was like finding a diamond when I did. I read his whole blog in one sitting. What I drew me to his blog was his nuance observations on human behaviours and characteristics. As a taxi driver, he has to opportunity to meet people from all walks of life and I think I can say I learned more about psychology from him than I did from my lectures. As an aspiring writer, it is my aim to be more observant on human interactions and Mr. Taxi Driver got it down. Actually, I think that is why most blogs written by waiters, bartenders or anyone working in the F&B, hospitality and service industries are extremely interesting. Because of their daily interactions with people day after day, they are able to understand or have a better understanding of the human psyche. The other reason why I was attracted to his blog was because I find it rather curious that a PhD. holder from a top American university was unable to find a job in Singapore. Singapore has a very liberal immigration policy and likes to attract the brightest minds (or what the Government call Foreign Talents) from all over the world (we have one of the lowest birth rates in the developed world). The fact that Mr. Taxi Driver is of Chinese ethnicity, a doctorate holder from Stanford and a scientist (none of that liberal artsy-fartsy character) should be a great catch for most government or private institutions in Singapore. Yet, he couldn’t get a job. I decided to read his blog to find out more about his situation. His first few posts describe the situation of his job loss, his inability to find a new one that result in him getting a job as a taxi driver. In those posts, he also writes about the uncertainties he and his family have to go through since he does not have any stable income. In Singapore, not having any stable income is almost as good as being poor. With our increasing high cost of living standards and stagnant wages, getting by is getting increasingly harder. Although he does harp about his misfortunes, you get the sense that he is really trying to make the best of his situation. But the entries I like best are the ones he writes about his interaction with his customers, his company and other taxi drivers. That is when you discover his powers of observation (he is a scientist after all). The first few entries can be rather long-winded. But as he wrote more, the writing tightens up, the prose becomes more clear and in fact, sometimes the ending can be totally bizarre and unexpected. It’s like reading mini-short stories again and again. The mark of a good writer, in my opinion, is someone who can convey a clear message to the readers in the tightest, cleanest, clearest prose possible. He was a local Chinese at least in his mid fifties. He was thin, of medium height, and carelessly dressed in a short sleeved shirt and long pants that looked like it had been worn continuously for days and smelled of garlic-marinated chicken barbecued by cigarette smoke. He had been holding the hand of the lady since I saw them. The sentence that I highlighted, I just love it. Just by reading the sentence, Mr. Taxi Driver managed to emasculate the essence of a character (or in his case, a customer) in a single sentence. You get the idea that his customer is not a savoury character, but neither is the customer a bad person. In other words, he is just a very real human being with flaws. There are two stories in that one post. The first one is mentioned above (it is about prostitution) and the second is about another customer (this time, gambling). The second story is short but is extremely well written and has an unexpected twist. So go visit Mr. 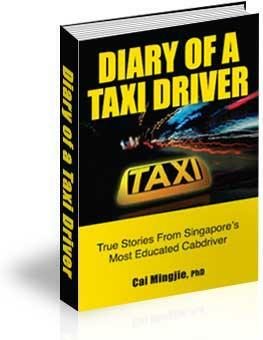 Taxi Driver’s blog and enjoy his tales about his interaction with people from Singapore or who came to visit Singapore. In fact, if you want to learn more about the culture of Singapore and the Singaporean psyche, you should read his blog. You will at least learn something from it. My dream is to flag down a taxi and discover that the driver is none other than Mr. Taxi Driver. What a happy day it will be for me. Unfortunately, with me being constantly broke, I can only take cabs under certain circumstances (like when my parents are paying the fare). P.S. I’m just a great fan of Mr. Taxi Driver. I am not promoting his site. He doesn’t needs any promotion. He already has hundreds of fans following his blog. P.S.S In case you think this is a fake site set up by some writer, I believe Mr. Taxi Driver blogged about his taxi license. Beside, if he was fake, the Singapore blogosphere would have exposed him by now. Remember the time I blogged about JamLegend? Well, thanks to my obsessive playing the past few days, I came across another band called Kill The Alarm. And they sound good live too. So what are you waiting for? Get addicted to JamLegend! And while you’re at it, get addicted to Kill The Alarm. This entry was posted in Cool Stuff, Websites, Writings by Zareth. Bookmark the permalink.